1423, Frankfurt, Sigismund of Luxembourg. 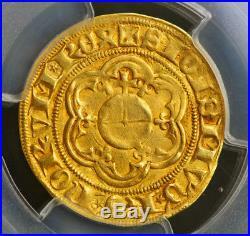 Gold Gulden (Ducat) Coin. Certified and graded by PCGS as AU-53! Reference: Friedberg 937, Joseph/Fellner 103, KM. 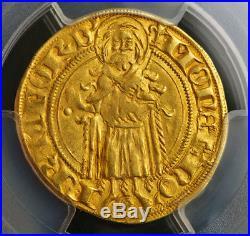 Mint Official: Vois II von Winterback (privy mark: crescent with face inside) Material: Pure Gold. 986 Diameter: 21mm Weight: 3.45gm. Obverse: Standing nimbate figure of Saint John, holding lis-topped scepter in left hand. Privy mark (crescent with face iniside) of the mint master below between his legs. Interesting privy mark (pellet) in left field! Legend: MONET’ NO’ (crescent with face iniside) FRA’ CFORD’ Reverse: Cross-topped imperial orb within polylobe with five lis symbols inwards. All within inner circle. Legend: + SIGISMV’ D’ RO’ NORVM’ REX. Frankfurt was one of the most important cities in the following Holy Roman Empire. From 855 the German kings and emperors were elected in Frankfurt and crowned in Aachen. From 1562 the kings/emperors were also crowned in Frankfurt, Maximilian II being the first. This tradition ended in 1792, when Franz II was elected. His coronation was deliberately held on Bastille Day, 14 July, the anniversary of the storming of the Bastille. The elections and coronations took place in St. Bartholomäus cathedral, known as the Kaiserdom (en: Emperor’s Cathedral), or in its predecessors. The Frankfurter Messe (Frankfurt Trade Fair) was first mentioned in 1150. In 1240, Emperor Friedrich II granted an Imperial privilege to its visitors, meaning they would be protected by the Empire. The fair became particularly important when similar fairs in French Beaucaire lost attraction around 1380. Book trade fairs have been held in Frankfurt since 1478. In 1372 Frankfurt became a Reichsstadt (en:Imperial city), i. Directly subordinate to the Holy Roman Emperor and not to a regional ruler or a local nobleman. Frankfurt managed to remain neutral during the Thirty Years’ War, but suffered from the bubonic plague that was brought to the city by refugees. After the end of the war, Frankfurt regained its wealth. Sigismund of Luxembourg (15 February 1368 9 December 1437) was Prince-elector of Brandenburg from 1378 until 1388 and from 1411 until 1415, King of Hungary and Croatia from 1387, King of Germany from 1411, King of Bohemia from 1419, King of Italy from 1431, and Holy Roman Emperor for four years from 1433 until 1437, the last male member of the House of Luxemburg. Sigismund von Luxembourg was the leader of the last West European Crusade – the Crusade of Nicopolis of 1396 to liberate Bulgaria and save Constantinople from the Turks. Afterwards he founded the Dragon Order to fight the Turks. He was regarded as highly educated, spoke several languages (among them; French, German, Hungarian, Italian, and Latin) and was an outgoing person who also took pleasure in the tournament. Sigismund was one of the driving forces behind the Council of Constance that ended the Papal Schism, but which in the end also led to the Hussite Wars that dominated the later period of Sigismund’s life. The item “1423, Frankfurt, Sigismund of Luxembourg. Gold Gulden (Ducat) Coin. 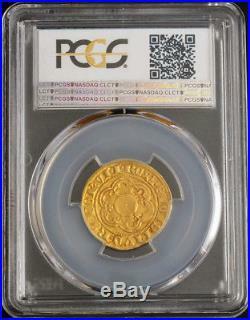 PCGS AU-53″ is in sale since Monday, May 14, 2018. This item is in the category “Coins & Paper Money\Coins\ World\Gold”. The seller is “coinworldtv” and is located in Europe. This item can be shipped worldwide. 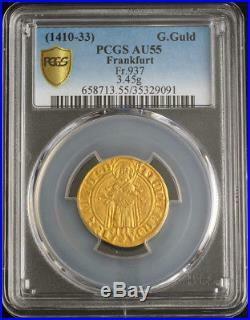 This entry was posted in frankfurt and tagged au-53, coin, ducat, frankfurt, gold, gulden, luxembourg, pcgs, sigismund.